Intelligent recruitment for talented temp teachers. all the while eliminating the need for cumbersome timesheets and paperwork. Simply take a moment to register your interest, and you'll soon look forward to an easier working life. Why register with Eddison Knight? TempBuddy was designed from the ground up to help local temp teachers streamline their working lives. Skilled temps are an extremely valuable resource, but finding and securing the right work isn’t easy. We didn’t think that was right, so we did something about it. We provide a direct link between you and the local schools who are looking for temporary teachers. Find work that matches your skills, talent and experience. Tired of printing off timesheets and delivering them to your recruitment agency? 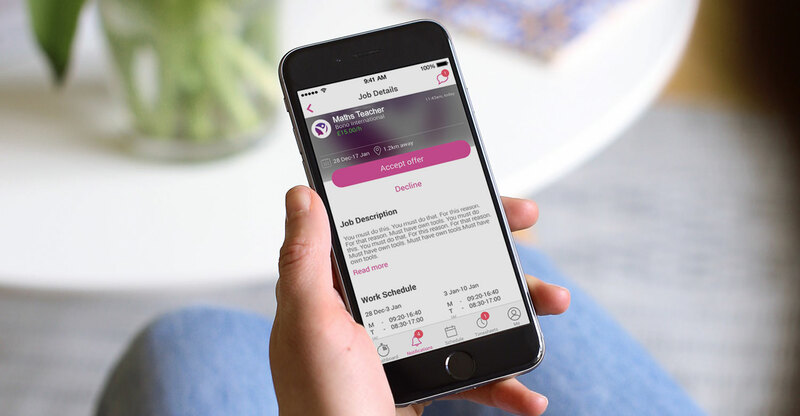 With TempBuddy, all of your hours can be logged and submitted within the mobile app. Easy. Working a contract for the next few weeks? TempBuddy lets you set your availability weeks in advance, so you aren’t bothered when you’re not available . We work with teachers and we work with schools, so we know how things get done. We also know how frustrating it can be to be a temp, and that's why we're giving you FREE use of TempBuddy. Temp with Eddison Knight for just 5 days per month and you’ll automatically get FREE access to our rewards scheme, Perkbox. This will give you benefits like free mobile phone insurance and high street discounts, as well as saving money on your weekly food shop. It’s an exclusive scheme designed specifically for hard working temps who register with TempBuddy. Our goal is to make your life easier. TempBuddy is revolutionary. Don’t miss out. Regain control of your work life balance today through smarter temping. Tell us a few things about yourself and we will tell you a lot more about the benefits of temping with us.